Genetically pure trees will be propagated and used in creek restoration projects in Contra Costa and Alameda Counties. We are hoping that our sample will include enough pure natives to provide some seed stock for each major area and adequate genetic diversity overall. Native walnuts (Juglans hindsii) grow both in creek channels and uplands, so everyone in the East Bay will benefit from having another species to use in their restoration projects. See a slideshow about the overall project including maps. Update, August 2016: More than half the samples are native! We don't know which ones yet, but we can begin to think about how to undertake propagation and restoration. Botanist Heath Bartosh standing at the base of the giant walnut on Carquinez Strait. 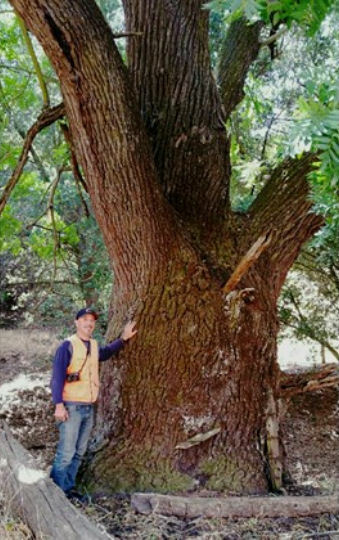 This and the Sunol tree appear to be the largest and oldest trees in our sample and therefore the best candidates to be genetically pure.